The Courage to Teach speaks to the joys and pains that teachers of every sort know well. Over the last 20 years, the book has helped countless educators reignite their passion, redirect their practice, and deal with the many pressures that accompany their vital work. Enriched by a new Foreword from Diana Chapman Walsh, the book builds on a simple premise: good teaching can never be reduced to technique. Good teaching comes from the identity and integrity of the teacher, that core of self where intellect, emotion, and spirit converge—enabling 'live encounters' between teachers, students, and subjects that are the key to deep and lasting learning. Good teachers love learners, learning, and the teaching life in a way that builds trust with students and colleagues, animates their daily practice, and keeps them coming back tomorrow. 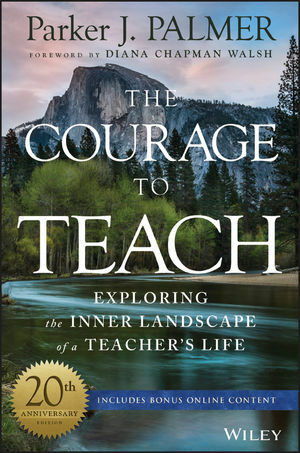 Learn how to forge learning connections with your students and "teach across the gap"
Whether used for personal study, book club exploration, or professional development, The Courage to Teach is rich with time-honored wisdom, and contemporary clarity about the ancient arts of teaching and learning. PARKER J. PALMER is a highlyrespected writer, lecturer, teacher, and activist. He is founder and Senior Partner of the Center for Courage & Renewal, which offers long-term retreat programs for people in the serving professions, including teachers, administrators, physicians, philanthropists, nonprofit leaders, and clergy. Author of nine books, including Let Your Life Speak, A Hidden Wholeness, Healing the Heart of Democracy, and The Heart of Higher Education, Palmer has been recognized with thirteen honorary doctorates and a number of national awards. He holds a Ph.D. from the University of California at Berkeley and lives in Madison, Wisconsin.